Defending a state title is never easy, but the Southwest DeKalb Panthers made it look easy with four gold medal performances on the way to a 58-44 win over Cedar Shoals at Memorial Stadium in Jefferson last weekend. The second consecutive Class 5A state title was the Panthers’ 10th as a program and coupled with Cedar Grove’s second consecutive Class 3A title extended DeKalb County’s string of consecutive seasons with at least one state title to 10. Trailing in the standings after the field events, the Panthers opened the track finals with a bang as the 4×100 meter relay team of Terry Conwell, Jaylan Muhammad, Justin Tomlin and Terryon Conwell ran a 41.06 to best last season’s 41.26 gold medal performance. Terry Conwell followed it up with a time of 47.54 to take the gold in the 400 meter dash and Terryon Conwell captured the 100 meter dash in 10.61. The two Conwell brothers helped the Panthers seal the state title with a 1-2 finish in the 200 meter dash with Terryon winning in 21.32 and Terry following in second at 21.47 to score 18 points to put the title out of reach of their competitors. 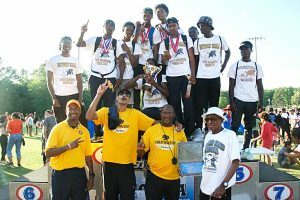 Stephenson gave DeKalb two Top 10 finishes as the Jaguars totaled 30 points good for sixth overall behind the double-gold medal performance of Denzel Harper. Harper won the long jump (23-04.00) on the field events day and then captured gold in the 300 meter hurdles with a time of 37.57. Harper added a fourth place in the 110 meter hurdles (14.56) and the 4×100 relay team also picked up a fourth place finish in 42.61. Miller Grove picked up six points with a bronze medal finish in the 4×400 meter relay (3:20.25) to finish in a tie for 31st. Druid Hills was in a tie for 42nd behind Deishawn Worrell’s sixth place finish in the 200 meter dash. Dunwoody picked up one point via Sam Haas’ eight place finish in the pole vault (12-00.00). The Lakeside Vikings made a strong run at the Class 6A Boys’ State Championships coming up just five points short to finish third behind Newton County (48-43). Campbell climbed into a tie with the Vikings at third with a strong finish in the 4×400 meter relay and South Gwinnett held on for second with 45 points. Senior distance runner Andrew Kent was a big factor in the run by the Vikings as he captured gold medals in both the 1600 meter run (4:13.07) by knocking 11 seconds off his qualifying time and the 3200 meter run (9:08.45). Senior teammate Davis Stockwell finished fifth in both events. Super freshman Brian Herron picked up a silver in the 400 meter dash (48.20) and sixth in the 200 meter dash (21.80). The 4×400 meter relay team’s fifth place finish (3:19.20) in the final even of the meet clinched the third place tie for the Vikings. Chance Boyd scored nine points in wheelchair competitions to help Lakeside finish 5th in the Class 1 Wheelchair State Championships. Boyd finished fourth in the 200 meter dash (46.93) and fifth in the 800 meter run (3:46.23).